Lounge away in our pedicure thrones, while our whirlpool bath soothes your tired feet. We shape and trim the nails & cuticles, remove calluses and provide a nourishing moisturizing treatment to the feet and lower leg area. 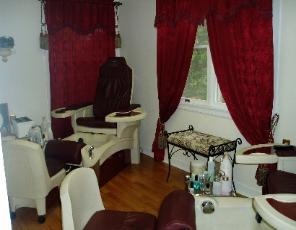 A light foot and lower leg massage is applied and followed up by perfectly polished toes. Specially warmed neck wraps scented with lavender and oatmeal along with a warm blanket are provided when in season. The feet are the most abused part of the body. There is no better way to manage stress and feel totally pampered than with a soothing pedicure that includes an element of foot massage, and the healing powers of Manuka Honey. Rich in vitamins and minerals that will nourish and revitalize the skin this is a must have pedicure for change of season, over tired feet and feet in need of a healthy healing. Let Sorella bring relief to weary legs and feet. You begin with a soothing foot soak to soften skin and relieve stress. Next, your feet are thoroughly exfoliated to remove roughness, dryness, and dead skin. Smooth, warm stones are then massaged into your feet and calves, rubbing out tension in an experience like no other.